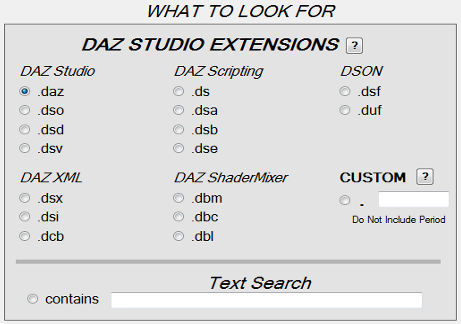 Sure you could manually search for DAZ Studio files or even use Windows Explorer's search box. And what will you get from all that effort? A simple list of matching files that you can't share with anyone or save so that you don't have to go through it all again. 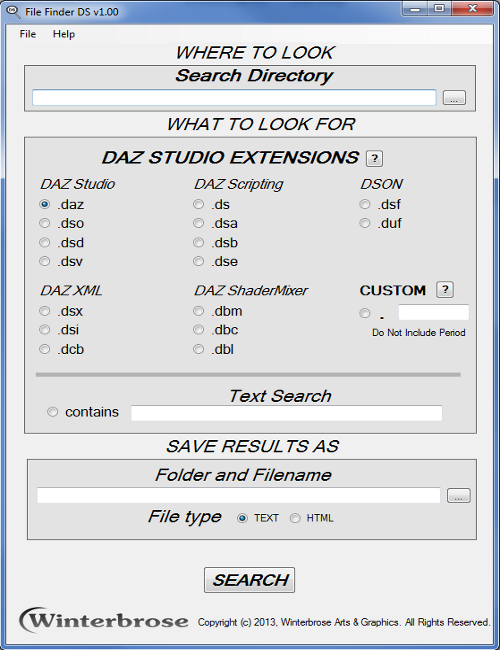 File Finder DS is an advanced and refined search tool to assist in finding DAZ Studio related files by filetype (extension) or specific text contained within filenames. 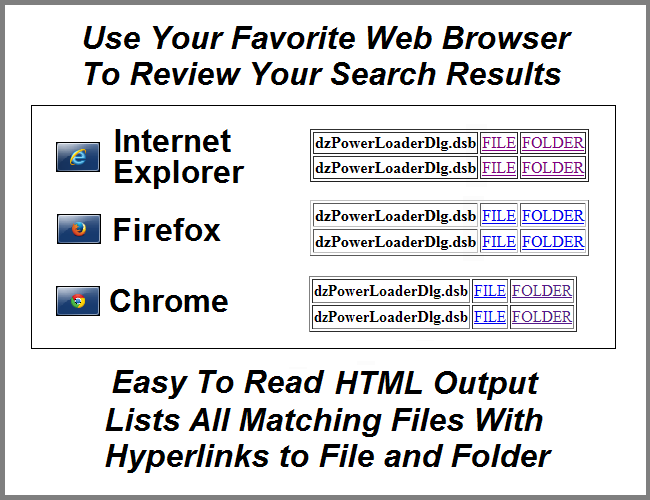 Search results can be output as plain TEXT which can be saved/shared or web browser compatible HTML files with hyperlinks to both the file found and the folder containing it. 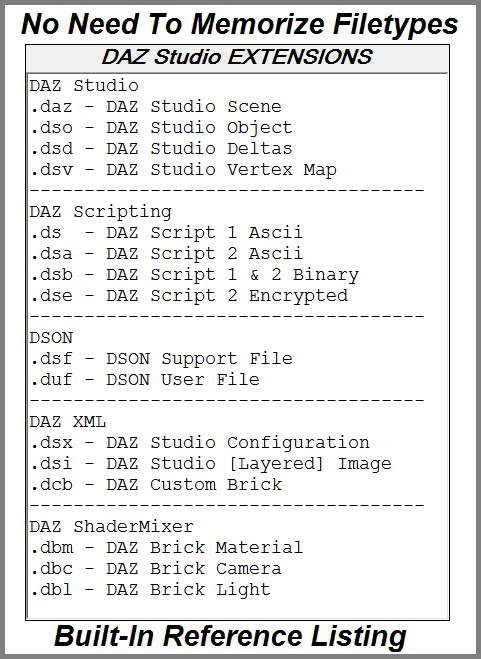 Ever find yourself looking for that special DSA script file or perhaps a recent DUF that doesn't seem to appear anywhere within DAZ Studio? Then File Finder DS to the rescue! With the right level of access and looking in the right places, no file can hide from your peering eyes. Choosing root directories may result in very long search times. 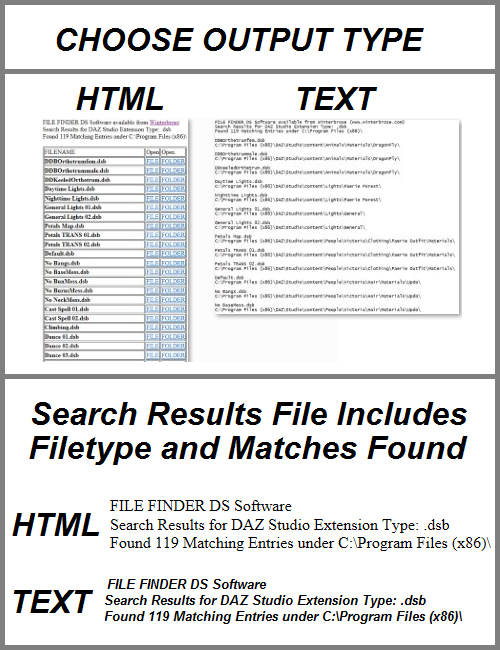 Here are the TEXT and HTML search results for a real search for any files of filetype ".dsb" in the folder/directory "C:\Program Files (x86)" on a machine using DAZ Studio. 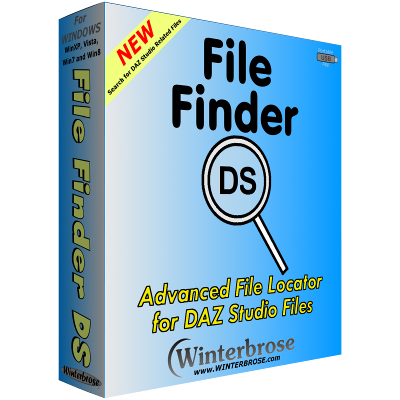 The purchase of File Finder DS software entitles the original purchaser to a non-transferrable single-user single-instance license for the software package to be installed on any computer system but to be executing on only a single computer system at any point in time. File Finder DS software is not authorized to be used for projects that violate copyright and trademark laws. 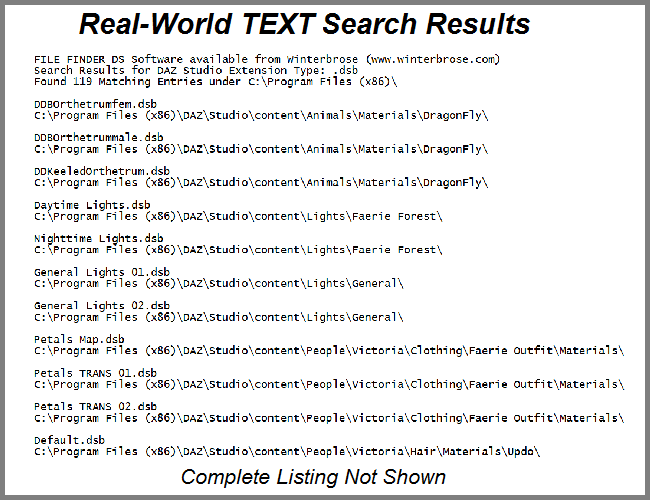 Purchasers will receive their personalized serial number from the reseller where purchased or directly from Winterbrose. 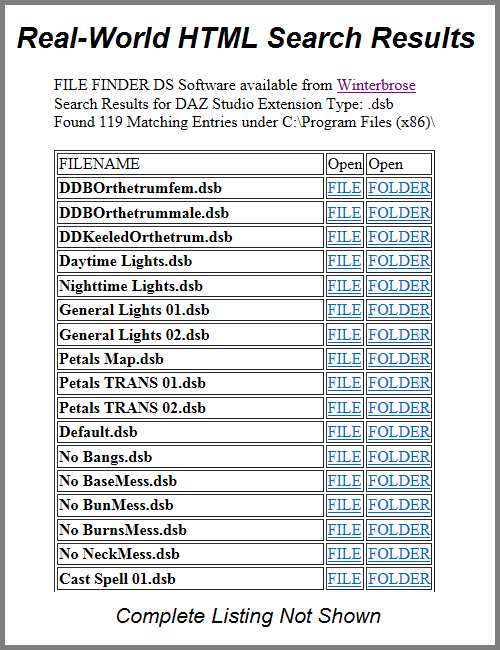 Please read this section carefully before purchasing File Finder DS. All sales are final! No refunds on purchased software! Every computer system has a unique hardware and software configuration. Under certain conditions, File Finder DS may impact or be impacted by your system's particular configuration. Therefore, all users are highly encouraged to download the Demo Version (if available) to ensure compatibility with your computer system BEFORE purchasing a copy of the software.